Car is definitely a need nowadays. It caters on the comfort of going places without the hassle and bustle of commuting. I knew there are tons of reason why we swap our car to a different car. This are the reason why I had been rooting in buying a car. I haven't made any move yet because I haven't seen a car company who can provide me with everything that I am looking for in a car. In my list aside from comfort, I wanted a car that is reliable and durable and of course budget friendly. Man! Who doesn't want those features. Seat belt reminder, adjustable lumbar support, adjustable headrest for driver's seat, leather seats, 3 point seat belts child safety lock, dual airbags, adjustable intensity of meter guage back light, automatic dimming rear view mirror, reverse sensor, remote control power windows, AM/FM Radio + CD player + Audio Input (AUX + USB), interior lights OFF delay and one touch-Electric Windows Control for driver. Here's the catch, its not the usual brand of truck but rather it is a THUNDER FOTON CAR! These can make me swap or buy a FOTON CAR. Swap or buy yours too. This FOTON TRUCK definitely rocks the world perfect for family getaways, for business and definitely for outreach program! This Thunder Foton Car is definitely a car worth investing for and this is the car I want for my outreach programs. 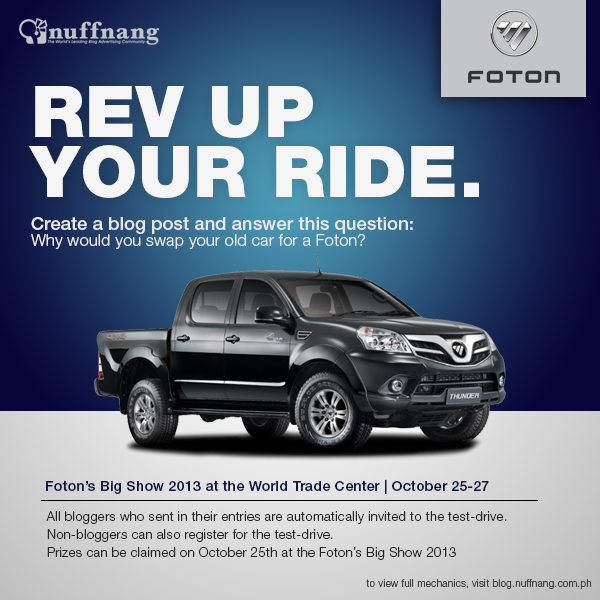 Swap your car or buy a Foton Car at Foton’s Big Show 2013′s Grand Launch. Get to know FOTON Car Register and Join Foton’s Big Show 2013′s Grand Launch at the World Trade Center on October 25 and witness the launching of the new FOTON View, the 1st dancing wheel loader in the Philippines. Get a chance to trade-in your old vehicles from October 26 to 27 avail of BIG DISCOUNTS and BIG REWARDS when purchasing FOTON vehicles at the event. Receive amazing giveaways just for coming and you get even more when you test drive our passenger vehicles or attend our forums and trainings. No entrance fee! My Thoughts: "The Blame Games they have to Play?"